Nearly two weeks ago I went to a concert. The music was loud and the concert was incredible! So incredible, in fact, that I would go and see this person in concert any time that he comes to town. The catch? This wasn't a "normal" concert. It wasn't a famous country or rock band, nor is this person famous. 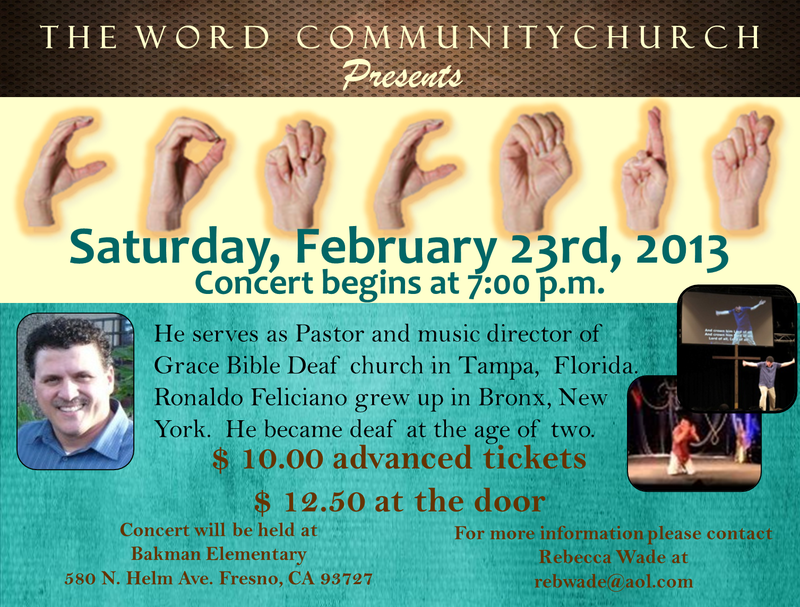 The concert was 100% Christian and focused on Christ...And the performer is hard-of-hearing, and did his concert all in American Sign Language (ASL). ASL is a new passion of mine. I look forward to every ASL class I have and I hunger to learn more about deaf culture, the language, and the people who use ASL as their first language. Maybe sometime I'll write a blog on "Why ASL?" to go in deeper detail about this newly found passion...But when I heard that there was going to be a Christian ASL concert, I knew I had to go! You might be sitting there, thinking, "A concert in ASL?? How can you have a concert in ASL?" At the end of this blog entry, I'll post a video of the man, Pastor Ronaldo Feliciano (who was the signer), so you can have a visual idea of what it was like. The concert was beautiful and inspiring. Like I mentioned above, the music was loud. (Deaf people like it loud so they can feel the beat to the songs.) As the music played, there was a projection on a screen behind him with the words to the song. While the song played, he passionately signed to the music, worshiping God in his language of signs. Watching him sign, you can tell how much love he has for God. And although I didn't understand each sign, as I am still learning the language, the message of Christ was clear. Going to this concert was a really great experience. I left the concert with a deeper desire to become fluent in ASL. Hearing the story and testimony of Pastor Ronaldo...Wow. 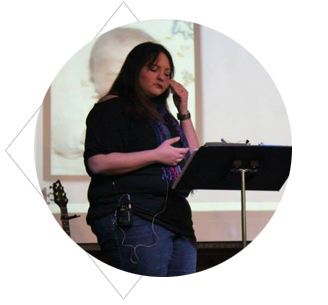 What an amazing testimony! God has really given him the unique gift of singing with signs, and God is really using him. Bellow is a video of one of the songs that he performed in concert. The video really does not do the concert experience justice. 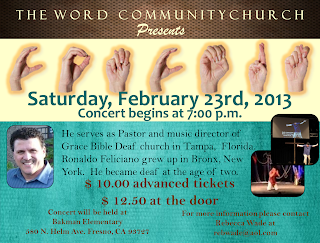 If you ever want to put on a deaf event in your community that focuses on God, I really recommend that you consider inviting Pastor Ronaldo to your church. (His goal is to travel and share the Gospel through music and signing.) You will be blessed! And, if you'd like to purchase DVDs of some of the songs he performs, you can Click Here.